Following the fuzzy border between Europe and Asia though Azerbaijan and Kazakhstan. Countries on the fuzzy edge between two continents are grappling with what it means to be in Europe or Asia today. The Europe–Asia border marker in Fatmayi, Azerbaijan. 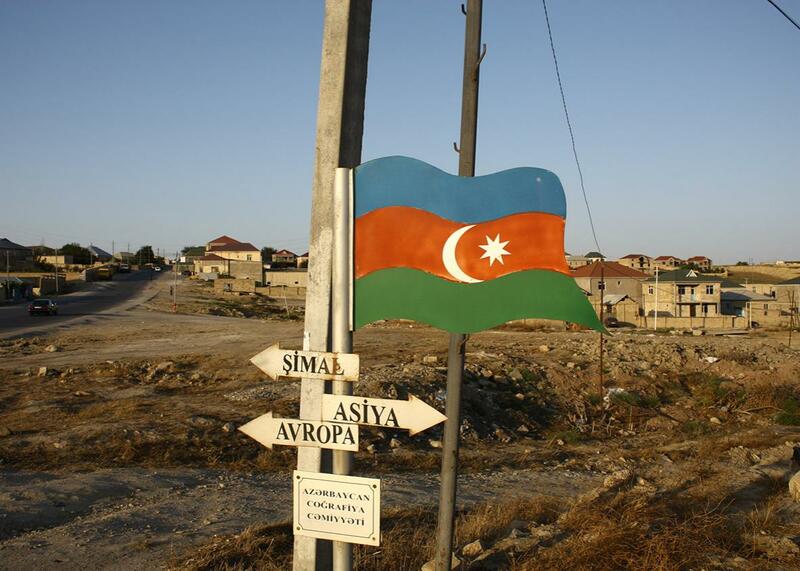 Beside a busy road on the outskirts of Baku, Azerbaijan, in the nondescript exurban village of Fatmayi, stands a small, hand-painted sign bearing the Azerbaijani flag and two arrows pointing in opposite directions: one toward “Avrupa” and the other to “Asiya.” It seems an unlikely place for a continental divide, with no apparent geographic features worthy of that distinction; the sign stands between an auto parts shop and a large pile of construction waste. But the Azerbaijan Geographical Society, which erected the sign in 2013, believes that this is the true border between Europe and Asia. While the spot’s significance may not be visible to the casual visitor, Azerbaijani geographers have determined that it lies on the continuation of the watershed of the Caucasus Mountains. And that means that a small slice of Azerbaijan—about one-sixteenth of the country’s territory—lies in Europe. Whether or not Azerbaijan is a European country has long been a fraught question, lying at the heart of the country’s national identity and its relationship to Islam, Russia, democracy, and modernity. Since gaining independence upon the collapse of the Soviet Union in 1991, Azerbaijan has portrayed itself as an Istanbulesque bridge between East and West. Baku hosted the Eurovision song contest in 2012 and was also a “capital of Islamic culture” in 2009. It organized the first (and probably only) European Games in 2015, and it will host the Islamic Solidarity Games in 2017. Outside the Old Wall was the Outer Town, with wide streets, high houses, its people noisy and greedy for money. This Outer Town was built because of the oil that comes from our desert and brings riches. There were theatres, schools, hospitals, libraries, policemen and beautiful women with naked shoulders. If there was shooting in the Outer Town, it was always about money. Europe’s geographical border began in the Outer Town, and that is where Nino lived. Inside the Old Wall the houses were narrow and curved like oriental daggers. Minarets pierced the mild moon, so different from the oil derricks the House of Nobel had erected. But geographers haven’t necessarily agreed with Ali or Aliyev. Although there are varying interpretations of how the border between Europe and Asia crosses the Caucasus isthmus between the Black Sea and Caspian Sea, they nearly all pass north of Azerbaijan, placing the country entirely within Asia. The Azerbaijan Geographical Society’s effort—part of a larger, international project, including geographers from Russia and Kazakhstan—aims to change that. The professor had a self-satisfied smile on his lips. We sat silent for a little while, overwhelmed by such mountains of wisdom, and the load of responsibility so suddenly laid upon our shoulders. Ali and Nino ends elegiacally, lamenting the dying beauty of Eastern tradition and predicting that Baku would inexorably Europeanize. And it was correct: At least by all the superficial standards that Ali used, Baku has lost its “Asianness.” Everyone eats at a table now rather than on the floor, and women are more likely to wear miniskirts than the veil. The old city, Ali’s Oriental redoubt, has been carefully restored and is now home to European embassies and carpet shops for tourists. The oil derricks are still outside the wall, but several foreign oil services companies, the successors to the Nobels—whose prizes were funded, in part, by their dominance of the 19th century oil boom here—have offices in restored Old Town buildings. I meet Altay Goyushov, a historian and one of Azerbaijan’s leading public intellectuals, in a café just a couple of blocks from the Old Town. I ask him a brief, open-ended question about Azerbaijan’s relationship to Europe, and he effortlessly launches into a sweeping overview of Azerbaijani history. For most of Azerbaijan’s history, he explains, people here didn’t consider themselves either Western or Eastern. “We knew who we are, and we didn’t think about it. It wasn’t important to us,” he says. But after Azerbaijan was colonized by Russia in the 19th century, Russian intellectual trends began to filter in. This was the era of the debate between the Russian “Westernizers,” who advocated adopting European customs and political ideas, and “Slavophiles,” who argued that Western ideas were unsuitable for Russia, which should follow its own path. “And this notion came to us that the West was developed, and we are underdeveloped, and that this is the difference between us,” Goyushov explains. Azerbaijan’s relationship to the West has been an enduring theme in Azerbaijani literature, starting well before Ali and Nino. Goyushov recommends the first modern play in Azerbaijani literature, The Botanist Monsieur Jordan and the Sorcerer-Dervish Mastali Shah, an 1850 comedy by Mirza Fatali Akhundov in which a French scientist butts heads with a superstitious mullah over the upbringing of a promising Azeri youth. In the 19th and 20th centuries, Azerbaijan developed a rich satiric literature, and jokes about Azerbaijan’s underdevelopment vis-a-vis Europe were a constant. “All of Azerbaijan literature is like this, to compare ourselves to the West, to criticize ourselves and praise the West—their development, their education, all these things,” Goyushov says. The anti-Western sentiment in Azerbaijan is still far from dominant, but it takes many forms: Islamism, nationalism, leftism. 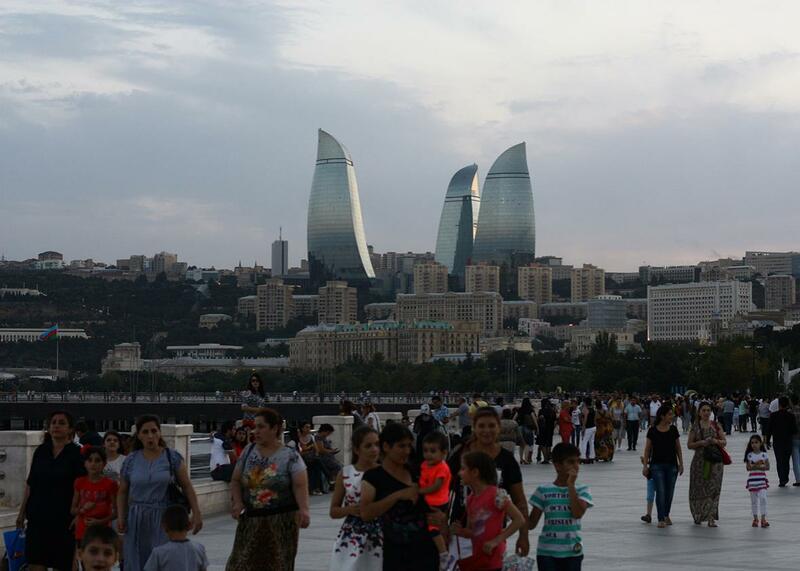 Even Baku’s liberal dissidents are disillusioned with the West for its close ties with Azerbaijan’s dictatorial government, in which “Western values” are sacrificed for the sake of geopolitics. And the government, too, has been increasingly distancing itself from a purely Western identity in order to justify its lack of adherence to Western norms on democracy and human rights. 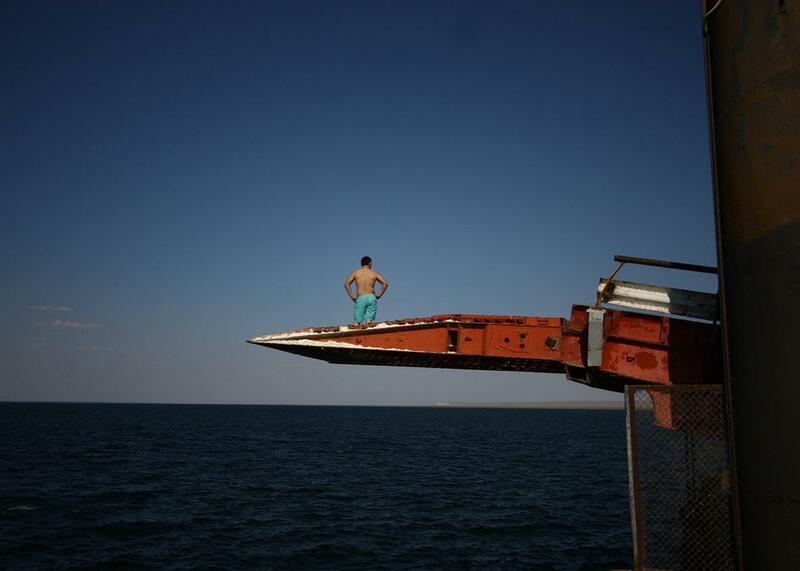 A man prepares to dive off a pier into the Caspian Sea in Sarytas, Kazakhstan, next to the spot where Russian geographers have determined is the true Europe–Asia border. A couple of days later I left Baku on a ferry across the Caspian Sea to Aktau, Kazakhstan. (Mammadov, the geographer, approved of this route: “Yes, that’s exactly where the border goes!”) My boat, the Professor Gül, had seen many better days, presumably when it plied the Poland-Sweden route (judging from the languages on the safety placards). These days that distinction isn’t so easy to make. Aktau is a bit of a dusty outpost, noteworthy mainly as Kazakhstan’s main port on the Caspian. But the streets are lit, and there is public transportation, and if Ali saw it, he’d no doubt approve of its theaters, schools, hospitals, libraries, policemen, and beautiful women with naked shoulders. Unlike Azerbaijan, Kazakhstan has a real geographical claim to being part of Europe: According to most conventions, the Ural River, which flows north from the Caspian Sea into Russia, forms part of the Europe-Asia boundary. And if you accept the Azerbaijani geographers’ new border, about one-third of Kazakhstan, the ninth-biggest country by land in the world, is within Europe. In spite of Nazarbayev’s efforts, it doesn’t seem that Kazakhs see themselves as very European, and the whole border-drawing enterprise seems to have engendered a good amount of skepticism in Kazakhstan. When the new border research was announced, a local news story headlined “A Third of Kazakhstan Belongs to Europe” reported that Kazakhstan might “be deprived” of some of its territory as a result. The Kazakh geographers who have been working on this didn’t respond to my request for an interview. 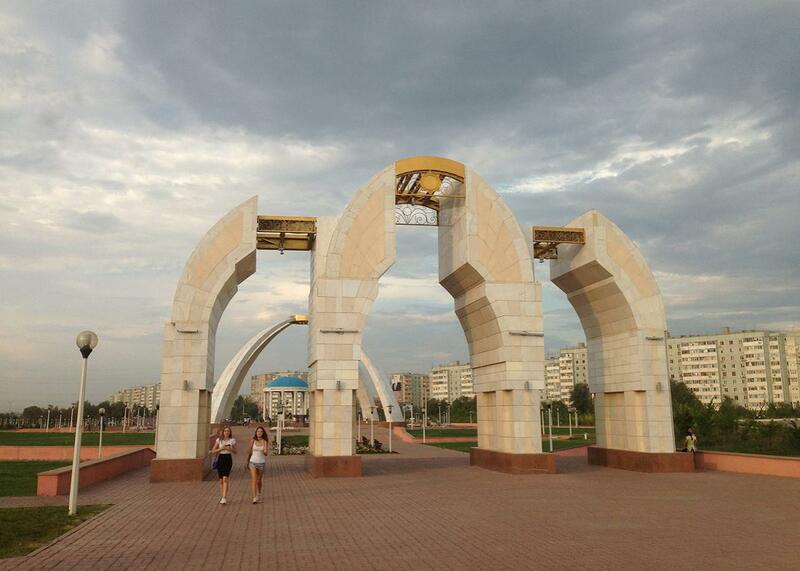 Kazakhstan has a couple of Europe-Asia monuments along the old border, including a Soviet-era obelisk in the city of Uralsk and a bridge over the Ural River in Atyrau that has signs marking “Asia” and “Europe” on each side. I instead headed to Aktobe, a city farther to the east, close to the new border, which has moved the city from Asia into Europe. I bought a ticket out of Aktobe on a train north to my next stop along the border, in Russia. But I missed the train, and while I was at the station’s ticket window sorting out what to do, a taxi driver kept pestering me. I generally consider taxi drivers who wait at train stations and airports to be among the lowest forms of humanity. Having missed my train, as well as lunch, I wasn’t as patient as I might have been. I said some intemperate things. As karma would have it, I ended up having to hire the driver to take me to a station farther up the line so I could catch up with my train. Once we were on the road I apologized for cursing at him and tried to explain that where I was from people didn’t accost you like that while you were trying to conduct your business. “That’s OK,” he said. “I apologize that we behave like that.” I said that wasn’t necessary; it was their country, and they can behave how they want, and some more culturally relativist things. He continued: “You know, people always criticize America for starting wars everywhere, but I think they do it right. If they didn’t do that, everyone else would always be fighting with one another.” It was an analogy I wasn’t entirely comfortable with, but with that, I was off to Russia.